Organize your Personal Documents and Financial Paperwork! From birth to death (and beyond), we collect all sorts of paperwork. 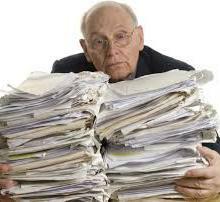 Unless organized, these documents and papers can ultimately become overwhelming! Family Documap© is a way to document, manage and maintain all your personal documents and financial paperwork (birth certificates to utility bills and everything in between). make timely decisions in the event of your disability or death? * Are bills, insurance papers and medical records separate and organized? * Is information about accounts and documents in a central location? * Do you know how long records need to be retained? If you answered “no” to any of these questions, you may be in need of a Certified Personal Document Specialist! Family Documap© makes maintaining your personal and financial documents easy.